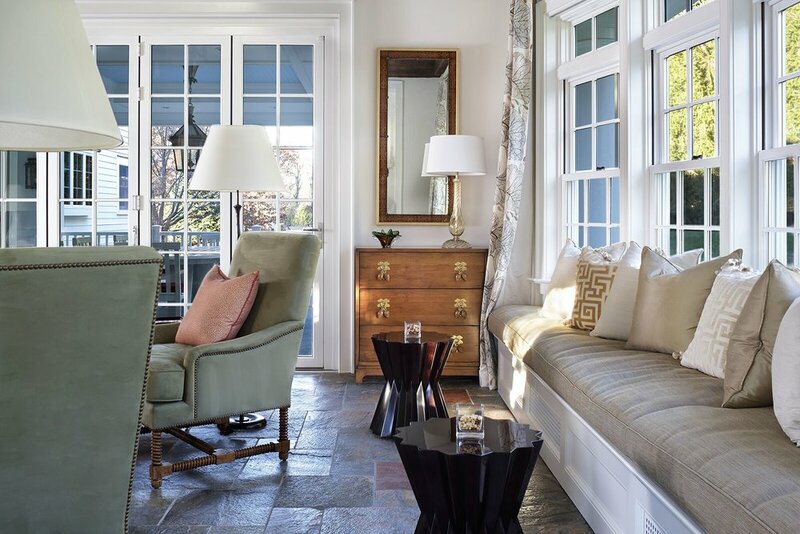 This ASID Award-winning sunroom inspires a sense of freshness and vitality. Artful furniture selections, whose curvilinear lines gracefully juxtapose the strong geometric lines of trusses and beams, reflect a measured study of shapes and materials that intermingle impeccably amidst a neutral color palette brushed with celebrations of coral and master millwork. Radiant-heated flooring and reclaimed wood lend warmth and comfort. Combining English, Spanish and fresh modern elements, this sunroom offers captivating views and easy access to the outside dining area, serving both form and function with inspiring gusto. A double-height ceiling with recessed LED lighting concealed in the beams seems at times to be the only thing tethering this airy expression of beauty and design excellence from floating directly into the sky.